On a recent foggy winter morning, I took a short trip to my Aunt and Uncle’s house to learn a new trade. My Aunt offered to share a skill that she has been practicing for more than 40 years. I lived in this house for 6 months when I first moved to Maine and started putting down roots, so I knew it well. This house is filled with braided rug inspiration, but I never felt the urge to braid until I needed rugs for my kid’s bedrooms – now is the time to give it a go! 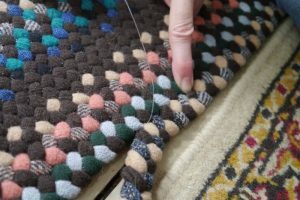 The purpose of this post is to provide an introduction to rug braiding. I plan to follow up with specific how-to posts as I get more proficient. We started the visit with cups of tea in hand and a tour around the house for inspiration. During our tour, we got the gist of the basics of rug making and design decisions along with tips that came to mind as we looked over each project. The basic rug making process consists of alternating between braiding and then lacing the braids to the rug. 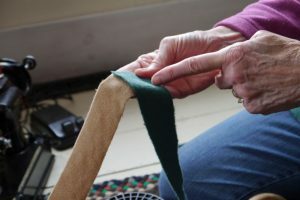 While it doesn’t seem to complicated there are tips and tricks to getting started, keeping the rug laying flat and hiding the seams – I am very happy to have a mentor for this journey. 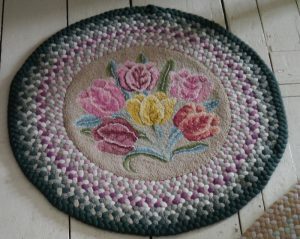 We started with my aunt’s current scrappy rug project. The photo above shows the braiding stand that she uses to hold the braid in place. 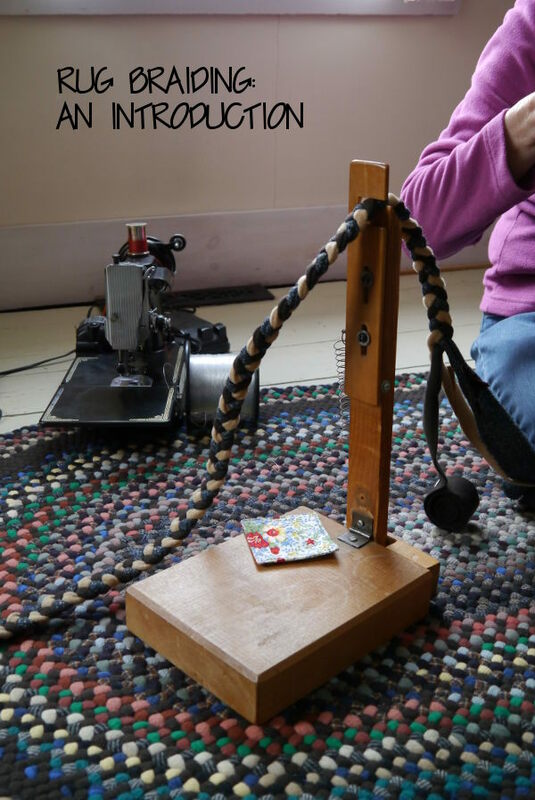 Martha keeps her Singer Featherweight machine on hand to quickly sew extra fabric strips to the braid while she works. The strips are added by sewing right-sides together on the bias. In the photo below, you see the the two strips placed together and Martha is pointing to the line along which she will sew. As you braid, you fold the raw edge of each strip to the center of the strip, then bring the the folded sides together with the raw edges inside. The first tip that came up was to use fabric that is about the same weight. If a fabric is too light, you can insert a filler fabric inside the fold that can’t be seen. Since the scrappy rug is a variety of fabric, she was currently using this technique. You can also create wider strips of the lighter weight fabric to make up the bulk. I suggest starting with fabric that is the same weight! The “travel” braiding stand made by my grandfather. As you can see Martha is working on this rug on the floor. The key to getting a flat rug is to use a flat surface, otherwise it could start to curl up on the corners, or the middle will ripple. You can also see in the photos that the strips of fabric are wound into flat rolls. The rolls are held together with a T-pin or you can use large safety pins if you have little kids around while you are working. This is also a great way to store the strips that you have prepared for your project before they are attached. Lacing the rug together with fishing line. 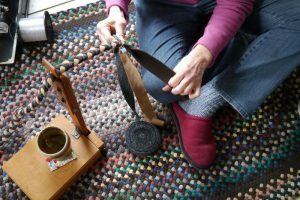 Once you have a good length of braid complete you can attach the braid to the rug by lacing it together. So far, I have found that there is a natural break point where you switch gears, either you need to sew more strips on or you just need a change of scene. Martha uses fishing line, but it is very common to use waxed cotton. I am not sure if this is something she tried out of necessity or if it is a common practice. A tool called a bodkin, which is a flat blunt needle made specifically for rug braiding. This entry was posted in Crafty and tagged braiding, diy, rug, singer featherweight, wool by beettheratrace. Bookmark the permalink. vital, as the wrong choice could mean a great deal of stuff. legs broke off and the foam core deformed easily.